Wildcat! Internet Net Server (WINS) is a powerful client/server system offering a complete, easy to install dialup and internet hosting system. For organizations who need just dialup, the internet is optional. Simply turn it off! However, because of the client/server framework, all modes of user connectivity are presented with a consistent message system and file upload/download system. Wildcat! is ideal for organizations who need a reliable File Exchange system, such as Medical Claims, Payroll, Insurance or for supporting your customers with products! The domain names specified above are not really necessary at the point of installation. For testing, you can use the local machine name of where you install WINSERVER. 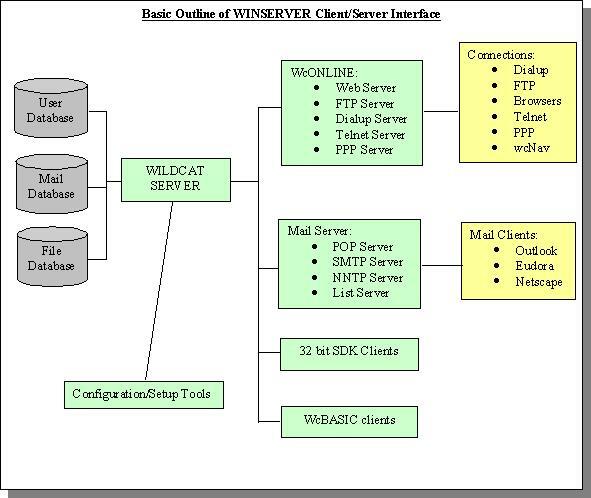 First, you install WINSERVER to a directory called \wc6. Answer yes to all the installation questions. When you are finished with the installation, you start the Wildcat! Server (wcServer) from the Windows Start Menu. 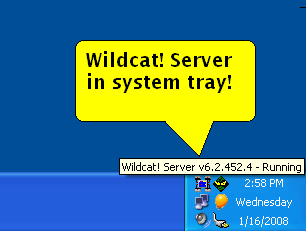 The server will appear as a little cat face icon on the task tray. You should hear it beep, signaling "All Systems Go!" Second, you run the Wildcat! Configuration utility (wcConfig) from the Windows Start Menu. wcConfig will present all the available setup options with an Explore like interface. Click here to see a detail view display of the Wildcat Configuration. Go to the General Setup options and fill in the Administrator name. For example purposes, we will use an employee named "Brad Breath". This person should be the top level person who will be the main user account on the system. He will be able to read private mail, manage files, create user accounts, etc. In short, he is GOD on this system!. You can use the name "Sysop" but it is not recommended for security reasons. Wildcat! already understands the name "Sysop" when writing messages to the sysop. All mail destined to "sysop" will be automatically directed to the administrator name. 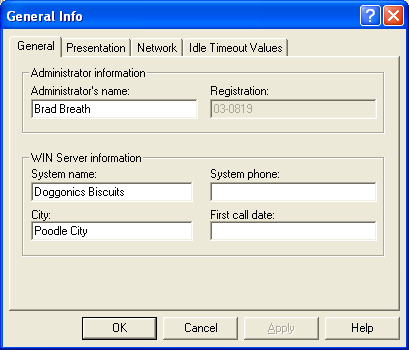 You can also change the BBS System Name to: "Doggonics Biscuits". Click here to see an image of the General Setup screen. Go to the Modem Node Settings option, and begin to add modems to the setup. Add four nodes for modems. It is ok to use TAPI or use the direct COMx name device. When you use the COMx device names, you must also know which modem profile to use for the particular type of modem installed on the COMx device. TAPI makes it easier by eliminating the need to know or understand MODEM AT commands. At this point, if you are not interested in setting up internet options, you are basically done with the connection type services. However you can go to the Computers Setup section and disable the internet options under the default settings. 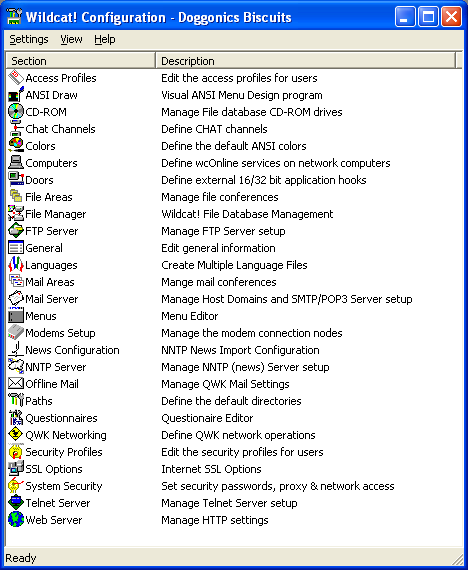 Click here to see an image of the Computers Setup default settings screen. 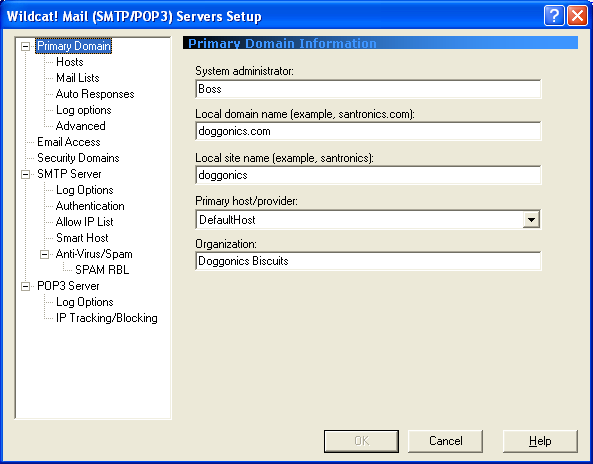 If you do plan to offer web services, put the domain name www.doggonics.com in the WWW HOST NAME field in the default Computers setup. At this point, if you not interested in setting up an EMAIL service you can skip this part. Otherwise go to Networking Setup and click the Host tab. 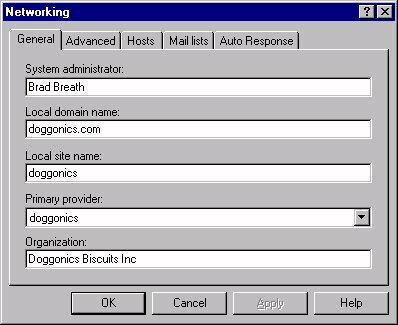 Click Add and type a host name of "Doggonics". Click OK then fill out the remaining new host information. Click here to see the host information screen. Save the new host information and click the General tab. In the General setup, fill in the information. Click here to see the general host information screen. You are now finished with the basic configuration! Close the Wildcat! Configuration program. At this point, with the Wildcat! server already running, you can start the Wildcat! Online Connection Manager and the Wildcat! Email Service. If the Wildcat! Server (wcServer) was not running or you wanted to provide an automatic reboot startup to begin everything, use the WcStart utility to create a startup configuration. Start the wcStart utility from the Windows Start Menu. The install program will add a shortcut to the desktop for wcStart. 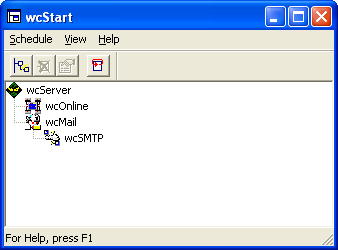 In this case, wcStart was configured to begin wcServer, followed by wcOnline and wcMail followed by wcSMTP. You can add wcStart to your Startup Folder with a command line parameter of /RUN so that the Windows system will automatically start the Wildcat! system for you. To manually begin the applications, start wcOnline, WcMail, and wcSMTP from the Windows Start Menu. WcMail and WcSMTP will place icons on the task tray. WcOnline will display a connection monitoring screen as shown below. In the above snap shot, we happen to have 2 modems setup with 3 users connected via the internet. For the fictitious example, you will see 4 modem nodes waiting to answer calls. All other internet connections will begin on node 5 and up. If a sysop is interested in seeing the session activity for one of the nodes above, you can double click on the node to start wcView. WcView will monitor the session. 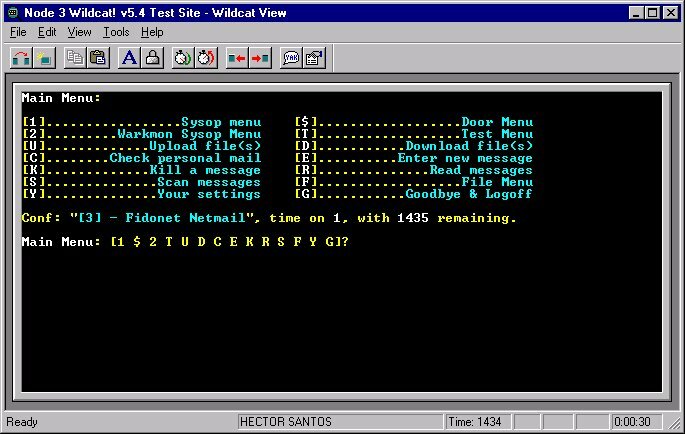 It will also allow the sysop to take control of the session as well as disconnect it. Click here to see a image of WcView in action. You can also run the wcNODE utility to monitor all the services and connections. Click here to see wcNode in action. To test a modem connect, use a telecommunications program and dial into the modem bank. Wildcat! also comes with a free GUI Frontend client called Wildcat! Navigator, WcNAV for short. You can distribute free of charge to users offering them an outstanding GUI interface into your Wildcat! Interactive (dot) NET system! This excellent client offers users dial-in and internet methods to connect. You can download wcNavigator from us now! Try it out against our own system at Santronics Online! That's it! It is all pretty basic stuff, yet Wildcat! Interactive Net Server is powerful and flexible! What we shown here was very typical, but there is much more to WINSERVER! Get your copy today and explore the power! If you have any questions, please don't hesitate to contact Santronics Software.